With the mood to bake this week, I made chocolate tarts the night before, and last night, it was Orange Centrepiece Cake, as I called it. It was quite a while since I had oranges at home as there was no promotion at the supermarket for oranges. :p Usually, my hubby buys oranges in tens when there are promotions. However, lately, there wasn't much promotion, so we didn't have them at home. Yesterday, we managed to buy 20 oranges from Giant as they were having promotions for this weekend. 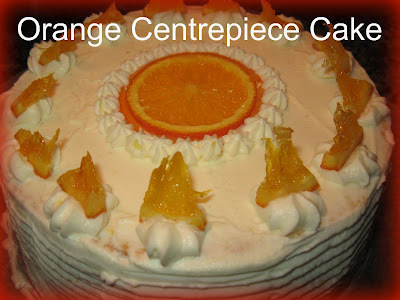 As I have always like to bake with oranges, I decided to bake an orange cake. And I suddenly found the passion to do some frosting and the inspiration to decorate the cake. Initially, I wanted to caramelise the orange slices for decoration. Then I realised they don't solidified in the sugar solution. So I decided to grill the "sugar-coated" orange slices in the oven. Then after a while, I realised they don't browned. So I gave up and took them out of the oven. While I was whisking the whipped cream, I didn't wanted to waste the "orange-sugar syrup" which I used to "caramelise" my oranges. So I poured the syrup into the whipped cream. They really taste good! Then I got pretty excited about the whole decoration. So I started frosting the cake, layer by layer, bit by bit. In the end, I was quite happy with my own decoration. However, the frosting needs real improvement. It was...er... still not up to standard yet. The overall taste & look of the cake (from far) was pretty good! I'm very happy with this "production"! These were the chocolate tarts that I made the day before. I made into three different tastes: Chocolate & Almond tartlets, Chocolate & Strawberry tartlets and Irish Creme Caramel Chocolate Tarts. 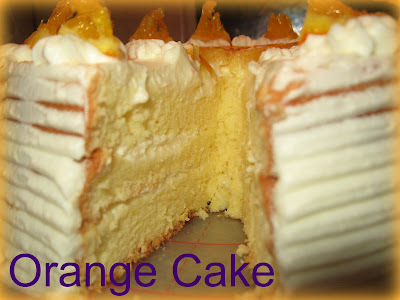 Wow, great looking Orange cake...looks really soft on the inside. So did you use Prima Flour Top flour? Any different from normal flour? Thanks! I didn't use Top flour. :p I substitute it for cake flour though. Didn't wanna just buy top flour to make this cake. :p You can do the same too. It's really very soft using the chiffon method to bake cakes.